When it comes to photographing kids, even the pros need a few tricks to get the perfect shot. So don’t fret the next time your kiddo won’t stop making faces or is too fidgety: try one of the hacks for common kiddo photo problems. We’re pretty sure you’ll be happy and so will the grandparents! Scroll down for the solutions! 1. The Hack: Disable the flash. Skip the whole “how-do-I-use-this-flash” drama by snapping your pics during the day and preferably outdoors (or near an open window). Pictures that have to be taken with a flash often have a strange, yellow hue, which is not what you want for your wee subjects. 2. The Hack: Use a car window foil screen to prevent glare. If you’re getting nothing but squinty eyes and scrunchy faces courtesy of the sun’s glare (see photo below), try this. Have you or your little one hold car window foil screen outside the shot. The screen makes a great reflector that’s perfect for redirecting light in outdoor shots. 3. The Hack: Stick a lovie on top of the camera. For little ones who are looking in every direction, except for the direction of the camera, duct tape a small stuffed animal to the top of the camera to encourage them to look at that object (and — ta-da! — at the camera). So sneaky. 4. The Hack: Get close. And then get closer. Those cheeks. Those eyes. That wispy hair. That’s the kind of detail that you can’t capture by snapping a photo of your kid from a distance. Get right up on them (and don’t worry about cutting off a tip of their ear or part of their cheek) for a must-frame photo of your littles adorable face. 5. The Hack: Cover the lens with an old stocking. Repurpose that sheer stocking that just got a run in it by securing a piece of it over your camera lens with a rubber band. The result? You’ll get this gorgeous soft focus family photo that looks like it was shot by a pro. 6. The Hack: Use your iPhone headphones as a shutter button. Taking a family selfie is no easy feat … unless you’re an iPhone user. You can actually take photos using the volume control on your iPhone headphones (the ones that come in the box). Prop the camera up, pose, and shoot. Easy-peasy. 7. The Hack: Use the rule of thirds. If you are using a camera phone, turn the grid option on. It’s one of the easiest ways to snap a cool slightly off-centered photo just like a pro with a fancy Nikon or Cannon. Line up your subject into one-third of the right, left, top, or bottom of the grid. 8. The Hack: Make an insta-tripod with binder clips. No matter how well-behaved your mini models are acting, a shaky hand can make the perfect smartphone shot look blurry or crooked. 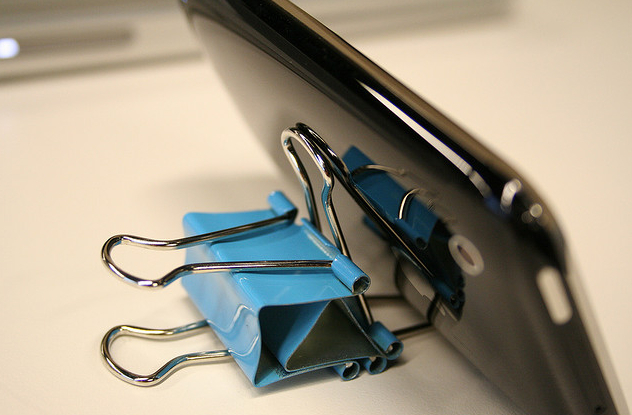 Prevent this phenomenon by attaching two binder clips to the side or back of your mobile phone. If you want in on the photo, use the headphones hack from above. 9. The Hack: Tilt heads just so to prevent red eye. If red eye constantly ruins your family photos, try this: When using flash, have everyone look slightly above the camera so that their eyes won’t catch the flash head on. 10. The Hack: Turn your garage into a photo studio. Surprise! Your garage isn’t just good for storing sleds and scooters. Garages work well as a DIY photo studio because an open garage door lets in the perfect amount of soft, directional light. Simply hang a sheet as a backdrop beforehand. 11. The Hack: Use Vaseline to create an old school vignette-y look. You don’t have to be a fancy-pants photographer to give your photos a great vintage feel. The insider’s secret is to rub a little Vaseline on the sides of the lens and snap away. 12. The Hack: Stagger heads in family pics. A straight line of heads in a fam photo can look boring and super-staged. Your crew may get into the perfect pose naturally, but if not, just try to position them so that no head is directly on top of or beside one another. 13. The Hack: Tickle them for real looking smiles. When all else fails and they just won’t smile, get to tickling. Tickle smiles are some of the most genuine and natural smiles you’ll find. Try it! 14. The Hack: Use a coffee sleeve as lens hood. Save those java sleeves for your next photo session. You can use them for when the sun causes a glare on your camera lens, ruining your snapshot. What are your favorite photo-taking hacks? Tell us in the Comments section below.